Red-hot Bryson DeChambeau, meanwhile, has now won four of his last nine tournaments. SHANE LOWRY HAS continued his fizzing start to 2019 on the final day of the Dubai Desert Classic, with eight birdies across his final 12 holes vaulting him to a tie for 12th position. The tournament was won by one of the few golfers in better form that Lowry at the moment, as Bryson DeChambeau won for a fourth time in nine events. This was DeChambeau’s first win outside of the United States, and in winning by seven shots, he set a new tournament record. A tepid one-under 71 yesterday cost Lowry a chance to win the competition, but he found some sizzling form on the seventh hole today, going on to sink birdies at holes eight, 11, 13, 14, 16, 17, and 18 and ultimately finishing in a tie for 12th place, ten shots off winner DeChambeau. The American was the highest-ranked player in the field, and thus the title and the $3.25 million cleaved to form. Leading by one shot at the start of play, he pulled ahead from the chasing pack with three birdies in his first three holes, and then almost assured himself of his fourth win in last nine starts with an eagle on the 10th hole and a birdie on the 11th. At that stage, he was six ahead of the field. After making his only bogey of the day on the difficult par-four 12th hole, he added further birdies on the 13th, 14th and 17th holes to finish on eight-under par 64 for the day and 24-under for the four rounds, also the lowest in the history of the tournament. The previous biggest margin of victory was six by Ernie Els over Greg Norman in 1994. The old record for lowest tournament aggregate was set last year by Li Hao-tong (23-under par). England’s Matt Wallace (68), the most successful player on the European Tour last season with three wins, made a stunning birdie after spraying his tee shot wide right into the waste area on the 18th, to break out of a logjam on 16-under par and finish solo second at 17-under par 271. Two more Englishmen, Ian Poulter and Paul Waring had set the target by finishing on 16-under par with rounds of 64. They were later matched by 2017 champion Sergio Garcia (66) and 2001 winner Alvaro Quiros (both Spain), and the defending champion Li Hao-tong (71) of China to tie for third place. South Africa’s Justin Harding shot the best round of the day in the morning – a nine-under par 63 elevating him to tied eighth place at 15-under par in a group that also included Lee Westwood (67) of England. Email “Lowry continues sparkling form with eight-birdie finish at Dubai Desert Classic”. 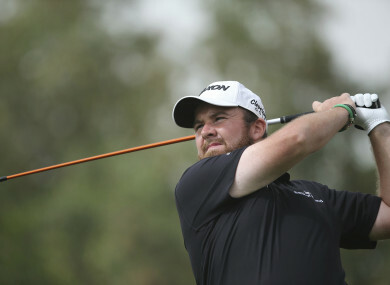 Feedback on “Lowry continues sparkling form with eight-birdie finish at Dubai Desert Classic”.